Through the years I’ve purchased and consumed a few bottles of Bordeaux. But it was always the lower end stuff and I’m not sure if I’d even purchased a Grand Cru. I’m leaving for Bordeaux Tuesday for the Fete le Vin wine festival. So a week ago I thought picking up a decent bottle was a necessary step in preparation. I was in Indy’s Kahn’s store on Keystone Ave. and Jim Arnold, the store owner, happened to come by and make comment about a bottle I was holding. 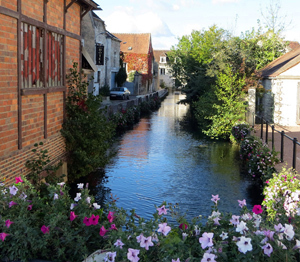 I told him I was headed to Bordeaux and would be visiting the Saint Emilion region and wanted to buy a bottle. 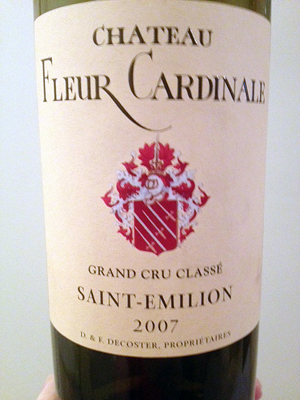 He suggested the 2007 Fleur Cardinale Grand Cru at about $45. I opened it Sunday night with some big ol Cowboy Ribeyes and it was just fabulous. Arnold suggested there are often great values in off-vintage years. Wine Spectator gave the ’07 vintage an 86 rating compared to the standout ’05’s 99 points. The 2006 was rated 89 points, the ’08 was up to 88 while the ’09 vintage scored a 96. The wine shop owner suggested looking for an off-vintage wine that has gotten good reviews. The Fleur Cardinal scored a 90 from Robert Parker so that was good enough for me. The wine was excellent with deep, dark fruit flavors, and really nicely balanced tannins. The wine was 75 percent Merlot, 15 percent Cabernet Franc, and 10 percent Cabernet. It was really elegant and silky wine perfect with the grilled ribeye. While $45 for a bottle is well above the price point I normally write about on Grape Sense, it’s fabulous wine for a special occasion. Arnold sells more Cardinale by case than any other Bordeaux.